The site will be moving soon to www.graylynloomis.com! Very exciting things ahead. 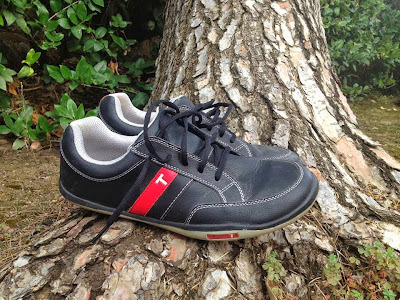 This review of TRUE Linkswear golf shoes was written by Andrew Rehfeld, who will hopefully be contributing more to the equipment section of the blog in the future. Choosing the right golf shoe is very important. The feet anchor a golfer’s swing, and many instructors insist on building the swing “from the ground up.” Finding a durable and comfortable shoe is especially important for the avid walking golfer. Recently, focus has shifted from shoes that will help the golf swing to finding an overall good shoe that can stand up to the many miles walked during a round of golf. Having owned everything from premium golf shoes in the $200+ price range all the way down to the $50 Steinmart special, I have seen many different designs that succeed and others that fail. Unfortunately, I can say with great certainty that the majority of my purchases fall in the latter camp FAIL. It seems that no matter what well-built, flashy design companies produce, I am never happy. With all the “hybrid” style and innovative shoes in recent years, it seems that the general golfing community has the same dissatisfaction with traditional golf shoes. My interest in TRUE Linkswear shoes began ever since I first saw Ryan Moore wearing wearing the brand. At that point, I had lost hope in any golf shoe satisfying my needs, and I wasn’t interested in shelling out any type of money for a new design that could possibly be even worse. However, I needed new shoes recently, so I decided to take the risk. On first examination, the TRUE phx looks like a casual “skateboard” style shoe. At $99 – though they have recently gotten a price reduction – the PHX is TRUE’s entry-level model, although it doesn’t portray the entry level in styling. While affordable, it’s clear that this shoe is well-built with its full leather upper. In regards to sizing, I would recommend trying the shoe on in person, since it seemed to run quite large. Compared to my Adidas Tour 360 shoes, I was a full size smaller – choosing a 9 instead of a 10. This may vary with foot shape, but it was certainly the case for me. However, I have also heard of other reviewers stating that the pricier TRUE models run a little smaller than the PHX since they have a sock liner. I have walked quite a few rounds in the shoes, and feel well qualified to review the product. My initial reaction is… WOW. My typical complaint with walking is pain in my big toes and rubbing on my Achilles tendon / heel area. I have suffered neither problem with this shoe. One thing that is different about the foot bed compared to other golf shoes is that it seems to slope up in the toes; this is hard to describe, but my foot is almost curved upwards when walking. This seems to support my toes and allow my foot to roll naturally when walking. I now believe that the pain in my toes came from the unnecessary energy used by my toes in previous pairs of shoes. TRUE Linkswear shoes allow your foot to roll and don’t bend quite as much in the toe as other shoes. I think this forces more of the energy of walking into the legs – I walk more with my thighs than with my ankles and toes. Being a hockey player, this has been great for me, since I have spent years building up my quads and legs skating. However, I could see others becoming oddly sore from this different motion. Regarding the rubbing against my Achilles tendon, the PHX has lots of padding around collar. I have noticed that more expensive, traditional shoes – such as the Tour 360 – are much slimmer and stiffer overall, and this seems to create uncomfortable pressure points. While cheaper shoes tend to have more padding, it is often weak and wears down quickly. I’ll have to see how this works in the long run, but it seems that the PHX provides both great durability and amount of padding. Because of this padding and its “skateboard” style, the phx appears more bulky, but it is significantly lighter than most golf shoes and the size is completely unnoticeable. The big issue people want to know regarding a spikeless golf shoe is… Will I slip? The answer to this question is a little nuanced, but the short answer is NO. Expensive, stiffer golf shoes try to create a solid platform from which to swing. The PHX does the opposite with its slim sole and pushes the golfer’s feet into the ground. Because of this, the golfer is more anchored into the ground instead of on top of the ground. I could see how this could be a preference issue. So no, you won’t slip, BUT that doesn’t mean this feeling is for everyone. Since I have a smooth tempo and don’t make a ton of aggressive swings, I like this feeling, and it seems to slow me down even more. So, are there are negatives to this shoe? Overall, I have not found anything about this shoe that I don’t like. 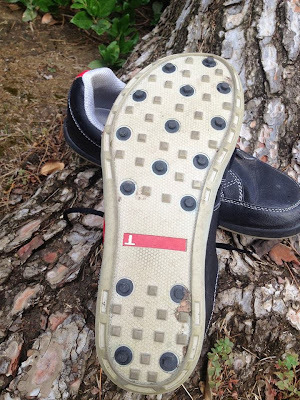 While there may be a preference issue with the spikeless, thin sole design, the shoe is brilliantly designed and passes all tests that I find important in a golf shoe. The non-traditional look might make some shy away and it’s probably not refined enough to wear at Augusta National, but for someone who walks consistently and needs to be comfortable, this is the shoe. If I had to rate the TRUE PHX out of ten, it would get a nine. The PHX only misses out on a perfect ten, because I know it’s not perfect for everyone. But, this shoe is perfect for the walking golfer who demands comfort above all other aspects. I have 2 pairs of TRUE shoes. I keep them for dry days since they get somewhat overwhelmed by long, wet grass. Otherwise I love them. I have walked quite a few rounds in the shoes, and feel well qualified to review the product. Getting a Tee Time on the Old Course? Adversity & Amusement, I bleed Golf.